Preparing to turn your child’s rear-facing car seat around? It might not be time yet, according to new guidelines from the American Academy of Pediatrics. As a parent, you celebrate each milestone achieved: Sitting up, crawling, taking a first step, waving good-bye. But graduating to a front-facing car seat? That’s one such milestone that shouldn’t be rushed, according to new guidelines from the American Academy of Pediatrics. For years, parents have learned that keeping a child rear-facing in a car seat until age 2 is the best practice. But now, that recommendation has been updated, advising parents to keep children in rear-facing seats beyond age 2 — and as long as possible. Purva Grover, MD, Director of Cleveland Clinic Children’s Pediatric Emergency Departments, says a child in a rear-facing seat faces less risk for serious (or fatal) injury if involved in a crash. “Because of the way their head and neck is positioned, when there is a big car crash involving a massive force – if they were to be front-facing, the positioning of the head and neck would give them bad whiplash and with small children, it could actually cause much more damage,” Dr. Grover explains. The AAP says that riding in a car is the most dangerous thing that children do as part of their daily routine. Research shows that vehicle crashes are the leading cause of death for children ages 4 and older. Experts say that using the correct safety or booster seat can help decrease the risk of serious injury or death by more than 70 percent. 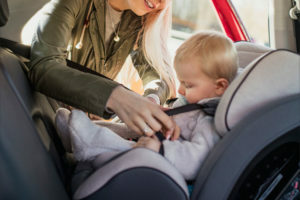 The updated recommendations also say that once children’s seats have been turned around, they should remain in a forward-facing car seat until the time they’ve reached the seat’s weight and length limits. Then, they should be transitioned to a booster seat. Children exceeding booster seat limits should use both a lap and shoulder seat belt, in the back seat of the car, until they are 13 years old. Dr. Grover agrees with the new recommendations, and says that when it comes to minimizing injury risk, safety should always before convenience. She adds that it’s important for pediatricians to talk to parents about the guidelines and explain why they’re in place. The compete recommendation is available via the American Academy of Pediatrics. Are Your Kids Afraid of ‘Killer Clowns’?